“I actually have to wear normal clothes again?” I uttered worryingly to my husband when my 14 weeks of blissful maternity leave was coming to an end. The idea of pulling together an outfit in my absolute exhausted stupor, let alone a stylish one (I am a fashion editor, after all) kind of terrified me. You see, for the best part of three months, I haven’t bought anything trendy, chic, or work appropriate. I have essentially been living in three items—loose sweatpants, a nursing bra, and an oversize gray V-neck T-shirt. And let’s be honest: I only ever put on my T-shirt when I knew visitors were coming. As a new mom, you soon learn that clothing yourself just gets in the way of countless feedings and spit-ups. Plus, who has time to do laundry? But here I am, faced with dressing my new postpartum body, figuring out a new pump-at-work situation, all while looking stylish for a chic office environment. Challenge accepted! It’s safe to say I am approaching my work wardrobe with clear and careful thought these days. Another challenge: I’m deliriously tired in the morning. I wake up at least three to four times throughout the night to attend to le bebe, so the outfit I’m throwing on at 7 a.m. needs to take zero effort and thought… but still look polished! Lastly, I’m very aware of my budget these days because baby-related Amazon Prime orders and the cost of childcare are real, my friends. Here’s how I’m addressing my postpartum back-to-work wardrobe without losing my personal sense of style. While I was pregnant, I was literally counting down the days until I could wear my high-waisted, stiff vintage Levi’s again. Well, this is the last thing I want to wear after having a baby. My postpartum frame needs bottoms with ample stretch that are comfortable and practical enough to bend and move freely in. I’m opting for stretchy jeans and pants instead. 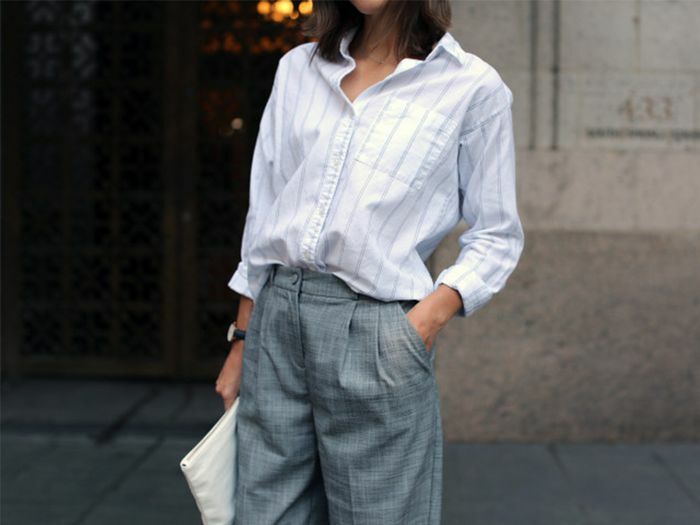 A classic, slightly oversize button-down is perennially chic and perfect for those in-between-meeting pumping sessions. An easy-to-slip-on-and-off wrap top also fits the bill perfectly. For now, I've cast aside most of my lace barely there bras for some stretchy and comfortable nursing bras instead. They are easy for breastfeeding pre- and post-work; plus, they’re soft, stretchy, and über-comfortable—perfect for anyone pumping. While dresses may be a super-easy option in the early hours of the morning, they are not the most convenient for a day of pumping. I'm trading them for a chic matching skirt set instead—an instant outfit with zero effort required. Toting your pump, bottles, and breastmilk just got chic. A smart and stylish pair of neutral loafers will work with every outfit and is the perfect solution when you're late and need to run to work. When all else fails, throw a sleek blazer over your outfit for instant polish. It will also mask that vomit stain on your shoulder. You're welcome! Up next: the maternity essential for anyone expecting this season.